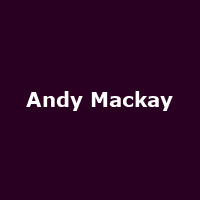 Andy Mackay is an English multi-instrumentalist and founder member of the band, Roxy Music, with whom he played the oboe and saxophone. Solo releases include the albums: "In Search of Eddie Riff" (1974), "Resolving Contradictions" (1978), "SAMAS Music for the Senses" (2004), "London! New York! Paris! Rome!" (2009) and 2018's: "3 Psalms".